What is PFC File Extension of AOL? A PFC file format is usually linked with America Online (AOL) applications. .pfc is the file extension storing contact information, email messages, user bookmarks, street addresses, etc. AOL PFC file is often referred to as a filing system in AOL desktop software, which enables users to save mails and organize them locally in the hard drive. PFC files assure smooth access of AOL emails even without internet connection. Each username has only one PFC file linked with it. PFC files let users create custom folders that makes categorization of emails simpler. Moreover, PFC files possess an in-built search option, which enables users to look for specific emails. The file location varies differently with different versions of Windows OS. Let us look at some PFC files location for different Windows OS. Trouble in accessing PFC Files? User has to check the system for invalid registry entries and speed matters. Scan the system for other slowdown issues and keep a check on unused processes. Assure that there are no unfavorable or unsuitable settings marked in the system. Note: Never rename the PFC File extension or even in any other file format. Doing this will not change the type of file. Only the specific software, which are designed keeping in mind the conversion process can migrates files from one file format to other. There are certain issues that users face while dealing with AOL PFC file format. These factors limit the accessibility of the Personal Filling Cabinet files. These issues/challenges/factors are mentioned below. Though AOL PFC file format are widely used yet they face certain challenges. The biggest challenge being that PFC file cannot be accessed from other machine. For example if an AOL desktop user logs into other system as a guest user or in case the user logs into his own system as a guest user, he will not be able to access PFC files. 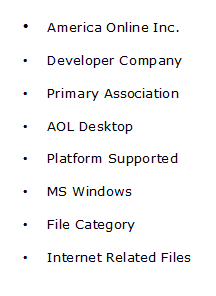 Another major concern regarding PFC file extension occurs when a user uninstalls AOL desktop from the system. As AOL desktop is uninstalled, the PFC files also get deleted. So, it is advisable to take regular backups of the files. PFC files can be archived both manually or by automatic backup setting. PFC Files are highly significant email files linked with American Online application. These files are compatible with both Windows and Mac. In this article, user get a deeper look on the entire technicalities of AOL PFC file format & the complete information related to PFC file extension.